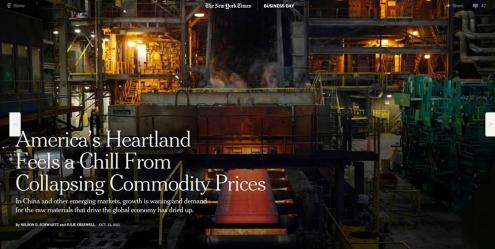 The recent article in the New York Times, “A Global Chill in Commodity Demand Hits America's Heartland” tells the story. This highlights the impact in 2015, and into 2016, of slowing international economic growth on tourism in the US and around the world. Indeed, some destinations in the heart of the US and in other commodity-driven economies such as Canada, Australia and New Zealand, are already confronting a slowing economy, driven by lower Chinese demand for everything from iron ore to corn, plus sharply declining commodity prices. While some economies such as the US, UK and Germany remain reasonably strong – and across the US, travel and tourism’s outlook in domestic travel is amongst the robust in the last decade, the picture is increasingly mixed. In short, a two-speed economy is emerging, with countries like Brazil and Australia and U.S. states like North Dakota, Illinois, Kentucky, Texas and, to some extent, Colorado, Ohio, Pennsylvania and Washington, already facing, or likely to face economic headwinds. Tourism marketers should think ahead and plan programs that focus on the above positives and mitigate the likely negatives. This includes focusing on markets where growth remains robust and reshaping campaigns in markets impacted by a slowing economy. This includes a greater focus on value, working with partners such as airlines to highlight the affordable nature of travel and clear and strong calls to action. For destinations, it is also time to highlight again the counter cyclical opportunities with tourism and to enhance their reporting to stakeholders (especially government stakeholders) on the benefits of tourism and destination marketing.